Once upon a time there were two people living and working in Fond du Lac, Wisconsin. 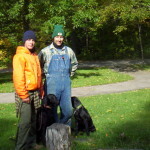 They were the “outdoorsy” type–enjoying walks in the woods, rustic camping, mountain biking, hiking, canoeing, and the like. They decided a move to the country would suit them, and so they did. In 1998, Joe and Nicole settled on a farm near the rural community of Oak Center. They had no intention of farming, only living in the quiet country. Before long, farm repairs were started and a garden and family were growing. The couple became serious “do-it-yourselfers,” growing and making much of their own food, homeschooling their three children, and living a simplified life in the country. With a family to feed, the garden began to grow. It got bigger every year. Then, one day in 2004, a friend offered to buy some of the vegetables they were growing. This was the birth of an idea: Maybe they could provide healthy food to families besides their own. They began researching ways to get their produce to others. Nicole was home full-time with the children. Joe was not at home full-time. So, they’d have to start very small. What would their market be? More research. Farmers markets would mean being off-farm for many hours at a time–not a viable option with three young children, and not personally appealing. How could they be on-farm as much as possible and make this work? They stumbled across the idea of Community Supported Agriculture (CSA) while visiting Prairie du Chien, WI, to see the Mississippi River with their children. In a cozy coffee house, Nicole noticed a brochure for a food program in Iowa. This was interesting and set in motion research on CSA. That was it! CSA was the way they could get produce to other families and people interested in good food and be able to stay on-farm as much as possible to work and care for the land they loved. 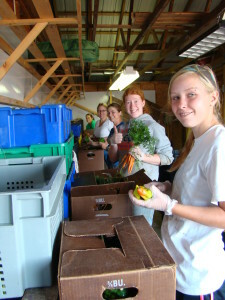 CSA, they realized, was a food system that strengthened the community and the local economy: a life-serving economy. This was getting better the more they learned! 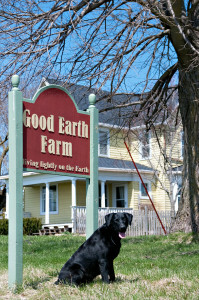 They named the farm “Good Earth Farm” after the 1931 book The Good Earth by Pearl S. Buck, which Nicole had recently read. 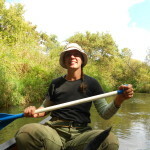 In 2006, Nicole started a 13-member CSA with the support of Joe still working off-farm. 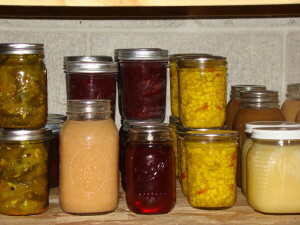 Each year the CSA grew: from 13 members in 2006 to 225 members in 2018. 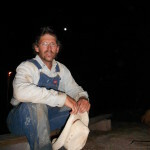 In 2009 Joe was able to be full-time on the farm; a very important goal from the start. Their care for the environment has expanded over the years. From the beginning, the couple knew that healthy farming meant farming responsibly. They’ve done that from Day One. Over the years, they’ve educated themselves on organic farming and environmental responsibility by attending classes, conferences, farm visits and workshops, plus conducting hands-on experimenting. They’ve read more books, papers, and publications about farming and the like than they can count. The internet, with its resources from university publications to videos by other farmers, has been a great learning alternative for the two. From non-farming backgrounds to full-fledged farmers, Nicole and Joe and their family appreciate the opportunity to live their lives fully at Good Earth Farm, and to provide good food to people in their community. This sometimes means long hours, but it also means feeling good after a day’s work; Meaningful work that encompasses the environment and the people in the environment. While the story of GEF begins with Nicole and Joe, it doesn’t continue with them alone. Over the past several years, many people have come into their lives and onto the farm. They have influenced, encouraged, and inspired Nicole and Joe — employees, interns, share workers, CSA members, family, and friends. Without them, Good Earth Farm would not be the farm it is today.